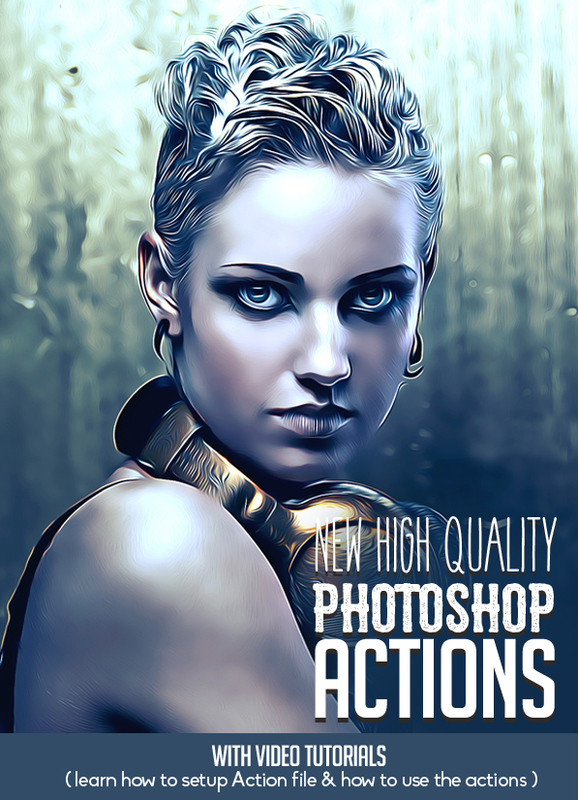 These Photoshop Action transform your photos into Oily effect, newspaper print, abstract, watercolor effect, comic and dots effects within a seconds. Mostly Photoshop actions available with video tutorials that shows how to setup action files and how to use. Every time you run the action you will get a highly detailed result, a lot of possibilities to easy customize and improve. This action is specially made for photographers, graphic designer & artists. There are so many Photoshop actions and effects are available for free download. The problem is that most of the free actions are low quality. In this post we’ll showcase some of the amazing ones so you won’t have to spend hours searching for them. All Photoshop actions are tested and working on Photoshop CS3, CS4, CS5, CS6, CC 2014, CC 2015, CC 2017+ Tested with more than 50 images to assure the integrity of the action. Just install and hit play action for awesome Oily Photography effect. This action will support in all photoshop versions (CS3, CS4, CS5, CS6, CC, CC14, CC15, CC16, CC17 & Upper ). You will get oily effect, cartoon effect & art effect from this action. Trying to represent high quality products that could make your work easier , Photoshop actions are my main activity … Squeezing my brain everyday to create a Brilliant Item , This item may be Live any time. New Photoshop Action with Abstract, Ink and sketch effects to the object on your image . Highly detailed result, easy to use, customize and improve. Watercolor Cartoon Painting Action is Very Useful Action pack. Two ATN (for CS & CC version) file with many effect and unlimited color effect. Editable Color Option. Editable layer option. Perfect layer decoration. Create realistic Newspaper patch artwork from any photo. Final effect includes Vintage effect and multiple Color effects. Its super easy to use and save yourself hours of work. Final composition is fully layered and provides lots of effects and customization. Use the included brush set to add even more details. 10 overall color presets are also included. Create realistic Architecture Sketch artwork from any photo. Turn it into a Blueprint in just a single click. Its super easy to use and save yourself hours of work. Final composition is fully layered and provides lots of effects and customization. Hide the Watercolor splatter folder and get a Pencil Sketch image. Use the included brush set to add even more details. Just install and play action for awesome oil paint effects. The action support photoshop version “CS6” only because in other version oil paint plugin not available. Every time you run the action an unique result will be produced, even if you don’t change anything. There are 4 actions included to generate 4 different colorscripts. The Film Builder is a special “mix and match” Photoshop action set than includes 62 actions. Each one of the 62 actions are made to be combined with one another to produce infinite variations of film/cross processing/vintage photography. In this Photoshop Action, you can create painting effect and animation effect for your images.Click here to go guide tutorial video to see how easy it is to run this action correctly. This photoshop action can transform your JPG image into look like watercolor painting animation Paint. Turn your photos in to interesting minimal graphic. The Action creates a minimal dots effect in selected areas and allows adjusting colors of each dots groups.